James Wilburn Bagwell was also known as Jessie Wilburn Bagwell.1 He was born on 5 December 1904 in Baxter County, Arkansas.1 He was the son of John Madison Bagwell and Mariah Josephine Mason.1 James Wilburn Bagwell died on 12 February 1983 in Pine Bluff, Jefferson County, Arkansas, at age 78.1 He was buried at Park Grove Cemetery, Broken Arrow, Tulsa County, Oklahoma. Alonzo Luther Bagwell was born on 27 February 1907 in Baxter County, Arkansas.1 He was the son of John Madison Bagwell and Mariah Josephine Mason.1 Alonzo Luther Bagwell married Flossie Helen Jones on 21 October 1929 at Broken Arrow, Oklahoma.1 Alonzo Luther Bagwell died on 16 January 1994 in Tulsa, Oklahoma, at age 86.1 He was buried at Park Grove Cemetery, Broken Arrow, Tulsa County, Oklahoma. Flossie Helen Jones was born on 12 April 1911 in Carroll County, Arkansas.1 As of 21 October 1929,her married name was Bagwell. She married Alonzo Luther Bagwell, son of John Madison Bagwell and Mariah Josephine Mason, on 21 October 1929 at Broken Arrow, Oklahoma.1 Flossie Helen Jones died on 22 October 2000 in Tulsa, Tulsa County, Oklahoma, at age 89.1 She was buried at Park Grove Cemetery, Broken Arrow, Tulsa County, Oklahoma. Johnnie Irene Bagwell was born on 7 July 1900 in Baxter County, Arkansas.1 She was the daughter of John Madison Bagwell and Mariah Josephine Mason.1 As of 23 May 1931,her married name was Smith.1 Johnnie Irene Bagwell married James L. Roy Smith on 23 May 1931 at Broken Arrow, Oklahoma.1 Johnnie Irene Bagwell died on 17 November 1986 in Broken Arrow, Oklahoma, at age 86.1 She was buried at Park Grove Cemetery, Broken Arrow, Tulsa County, Oklahoma. Funeral Services for Donald C. Bagwell have been scheduled for 2:00 PM, Wednesday, March 25, 2009 at First Baptist Church in Broken Arrow, Oklahoma. Rev. Hobe Ewing will officiate. Burial will follow at Floral Haven Memorial Gardens Cemetery in Broken Arrow under the direction of Hayhurst Funeral Home. Donald C. Bagwell was born January 7, 1921 in Broken Arrow, Oklahoma the son of William Roy and Ethel Ora (Smith) Bagwell. Don walked into the presence of Jesus on Saturday, March 21, 2009 at St. Francis Hospital in Tulsa, Oklahoma. He was 88 years of age. 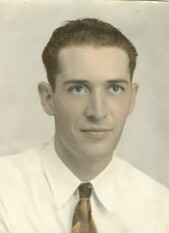 Don was a 1939 graduate of Broken Arrow, Oklahoma High School. He was a veteran of the United States Navy, serving during World War II as a Seabee in the Pacific theater and the Philippines. He married the former Miss Artie Mae Lawson on June 29, 1940 in Wagoner, Oklahoma. They spent 38 wonderful years together and enjoyed the home that Don built for them before Artie Mae preceded him in death. Don was a carpenter for 30 years at American Airlines before retiring in 1981. After retirement, he enjoyed building a second home in Alamo, Texas becoming a Winter Texan. He enjoyed fishing, photography, and traveling. When asked what was his favorite trip, he replied Visiting Point Barrow, Alaska. He diligently served his Lord as a Baptist deacon for over 50 years and was a member of First Baptist Church. Memorials may be made to the charity of your choice. To those that knew him he will be remembered for the strength that was shown through his hands. He was preceded in death by sister, Jewel Marie Ramsey. Tre and Chris Ronne, Edmond, OK. He was buried at Floral Haven Memorial Gardens, Broken Arrow, Tulsa County, Oklahoma. Hilda Delores Bagwell died on 9 October 1955 in Johnston County, North Carolina. She was born on 9 October 1955 in Johnston County, North Carolina. She was the daughter of Norvelle Bryant Bagwell and Ada Marie Butler. Betty Jean Bagwell is the daughter of Urias Bryant Bagwell and Mavis Spence. Linda Ann Bagwell is the daughter of Urias Bryant Bagwell and Mavis Spence. Jeanette Bagwell is the daughter of Urias Bryant Bagwell and Mavis Spence. Larry Gene Bagwell Jr. is the son of Larry Gene Bagwell and Charlotte (?) Larry Gene Bagwell Jr. married Mitzi Brown after 1980. Tom Sullivan is the son of Harold Edward Sullivan and Carolyn Schaefer. Tim Sullivan is the son of Harold Edward Sullivan and Carolyn Schaefer. Marianne Sullivan is the daughter of Harold Edward Sullivan and Carolyn Schaefer. Marianne Sullivan married Paul Cappel after 1970. Pam Sullivan is the daughter of Harold Edward Sullivan and Carolyn Schaefer. Pam Sullivan married Paul Wickham after 1970. Mike Sullivan is the son of Harold Edward Sullivan and Carolyn Schaefer. Colleen Marie Sullivan was born on 1 November 1958. She was the daughter of Harold Edward Sullivan and Carolyn Schaefer. As of 23 April 1983,her married name was Nelson. Colleen Marie Sullivan married Bill Nelson on 23 April 1983. 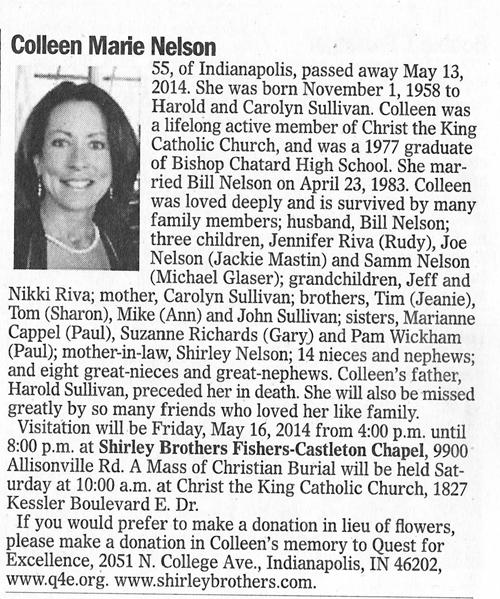 Colleen Marie Sullivan died on 13 May 2014 in Indianapolis, Marion County, Indiana, at age 55. Suzanne Sullivan is the daughter of Harold Edward Sullivan and Carolyn Schaefer. Suzanne Sullivan married Gary Richards after 1970. Eloise Marie Bagwell died on 26 May 204 in Tulsa, Tulsa County, Oklahoma. She was born on 25 March 1927 in Tampa, Hillsborough County, Florida.2,3 She was the daughter of Homer Virgil Bagwell and Audie Aquilla Bodine.1 Eloise Marie Bagwell married Billy Joe Cagle on 13 August 1947 at Guntersville, Alabama.2,3 As of 13 August 1947,her married name was Cagle. Dorothy Lucille Bagwell is the daughter of Jiles Leon Bagwell and Lucia Mae Capps. Dorothy Lucille Bagwell married Willie Earle Reese on 15 July 1939 at Easley, Pickens County, South Carolina. GREENVILLE, SC - Helen Bagwell Allen, 85, formerly of 1 Templewood Drive, was called home to be with the Lord on Friday, December 14, 2007. Born in Easley, Mrs. Allen was the widow of Joe R. Allen and the daughter of the late Giles Leon and Lucia Mae Capps Bagwell. She was retired from Her Majesty, where she was employed for 42 years. She was a member of Oakcrest Baptist Church. She is survived by a daughter, JoAnn Madden of Fountain Inn; a grandson, Joey Page of Fountain Inn; a great-granddaughter, Tara E. Holmes and her companion, Richard Baker of Spartanburg; two great-great-grandchildren, Logan Taylor Tay and Madison McKinley Baker; two sisters, Lucille B. Smith of Greenville, and Juanita Lawson of Dacusville. Funeral services will be held at 1:30 p.m. on Monday, December 17, 2007, in the chapel of Thomas McAfee Funeral Home, Downtown, with visitation prior to the service from noon until 1:15 p.m. at the funeral home. Burial will be at Graceland Cemetery, West. Memorials may be made to Samaritan Hospice, 500 Jeff Davis Drive, Spartanburg, SC 29303 or Laurel Baye Health Care, 661 Rutherford Road, Greenville, SC 29609. The family wishes to express their sincere appreciation to the staff of Samaritan Hospice and Laurel Baye Health Care for their loving care of Helen. [S2205] Helen Bagwell Allen Grave Stone, Find a Grave, www.findagrave.com.